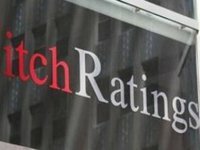 Fitch Ratings has affirmed Ukraine's Long-Term Foreign-Currency Issuer Default Rating (IDR) at 'B-' with a Stable Outlook. Fitch said in its press release that Ukraine's ratings balance weak external liquidity, high external financing needs driven by sovereign external debt repayments, a weak banking sector, institutional constraints and political risks in relation to peers, against improved policy credibility and consistency, improving macroeconomic stability, declining government debt and a track record of bilateral and multilateral support. "Increased exchange rate flexibility, unlocking of external financing through the new IMF programme and moderate external imbalances mitigate near-term pressures on international reserves," Fitch said. Fitch said that timely compliance with the new IMF programme is key to facilitate external financing, support progress in macroeconomic stability and mitigate vulnerabilities related to weak external liquidity, the potential for increased domestic political uncertainty and broader emerging markets volatility.